For as long as there have been documentaries, there have been debates about what exactly constitutes “reality” in those films. Labeling these movies as nonfiction has always been misleading—just because you’re capturing “real” people doing “real” things doesn’t mean you’re necessarily presenting an unfiltered representation of real life. Every documentary filmmaker is offering his or her version of the truth, and observant audiences should always question the “reality” they’re watching. It’s not that these directors are actively deceiving us—it’s just that real life is never quite as unvarnished or straightforward as we pretend to think it is. The terrific documentary Under the Sun doesn’t just bring these questions to light but makes them part of the film’s central focus. Daring and thought-provoking, director Vitaly Mansky’s film uses one North Korean family to examine how everyone—moviemakers, governments, even individuals—contorts reality to fit specific purposes. In an opening on-screen crawl, we’re informed that Mansky and his team were given a script from North Korean officials, who wanted to commission a film about a typical, happy mother, father and daughter living in Pyongyang. As Under the Sun rolls along, though, it becomes clear that Mansky doesn’t just have to follow a script but also the rules laid out by a mostly off-camera overseer, who directs the family and others how to behave. (Repeatedly, the father’s and mother’s coworkers are instructed to react more demonstratively about some good news.) In addition, falsities are presented as facts: Both parents have been given more prestigious jobs than the ones they actually have, and the family has been moved to a better home for the shoot. A more simplistic Under the Sun would merely enjoy these bizarre distortions of reality, making satiric sport of North Korea’s obsession with manufacturing a triumphant narrative about itself as a feared, unequaled global superpower. 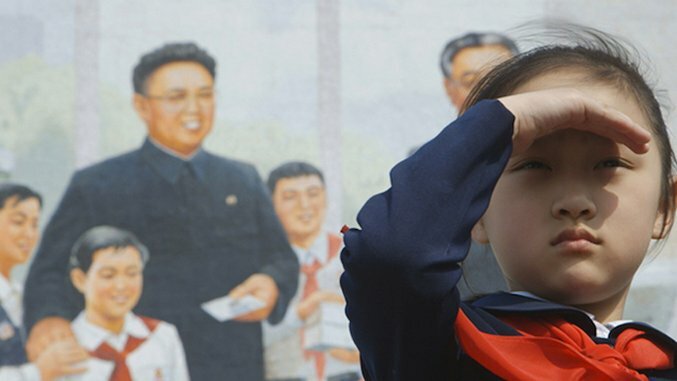 (For instance, schoolchildren are taught that past Korean leaders hurled boulders to vanquish their foreign enemies.) And at first, the Ukrainian-born Mansky seems content to let his film stay on that bemused surface. But soon, Under the Sun becomes a penetrating essay about surfaces themselves, asking us to examine how we receive information from movies, whether they be dramas, documentaries or state-sanctioned propaganda. Under the Sun’s main subject is Zin-mi, an 8-year-old girl who has one of those beatific faces made for a movie screen. A dutiful, sweet child, Zin-mi is about to join North Korea’s Children’s Union, an event that is meant to form the narrative spine for the film that the government officials want Mansky to make. And so, it’s through her big, quiet eyes that we see how a whole nation is indoctrinated, her unblemished face a defenseless receptacle for absorbing so many untruths. Throughout Under the Sun, we’re witness to lie after lie, none of which Zin-mi is old enough or sophisticated enough to discern. The juxtaposition between the banal, drab settings and these outrageous falsehoods starts off as funny, but they accrue a sickening, chilling power over time as we see the lengths by which North Korea’s government has warped the minds of its cloistered citizens. Simultaneously, though, Mansky seems to be commenting on the dehumanizing aspects of everyday life that we all simply accept. It’s not uncommon for critics and viewers to accidentally describe the people in documentaries as characters, treating them not as real people but, rather, artificial constructions. Under the Sun twists that notion: Zin-mi and her parents are real people, but they’re being directed by the North Korean overseer so that they’re happier, more fulfilled versions of themselves. They are, in a sense, actually being turned into characters. With amazing subtlety, Mansky drives this point home through his unadorned camera placements, which can either render the family as blandly anonymous or, occasionally, as dramatic cinematic figures. Either way, these people don’t read as “real”—they’re just actors in a movie up on a screen. Under the Sun keeps forcing us to ponder why we watch representations of real life and what we think we’re learning about reality in the process—especially when, like in this film, much of it has been scripted for the purpose of advancing a specific agenda. Featuring a spare score from Karlis Auzans that underlines ordinary North Koreans’ anguish, Under the Sun shows us predictable scenes of mass celebrations in honor of Kim Jong-un—as well as empty, impoverished streets that emphasize the country’s economic woes. But anybody who watches this film and feels smug ought to be careful. With its doctored history and carefully choreographed celebrations to itself, North Korea may be ridiculous, but it’s also an amplified version of the same nationalist tendencies that can flare up everywhere—something we’ve seen across the West in the era of Brexit and Trump. Sure, no one in America is trying to brainwash our children the way that the communist country is sculpting their young minds. But from North Korea’s small fibs about domestic bliss to the grand whoppers about its national might, the lies in Under the Sun should make us all reconsider the many, often minute ways that “reality” gets warped. We shouldn’t be so arrogant to think that Zin-mi is the only person too naïve to see the truth.